A barking Farfel didn’t disrupt Rob and Akiva from discussing the fourth episode of season three titled “The Dog”. This episode first aired October 9th, 1991, and was widely panned as a subpar episode. Akiva pointed out that other than “The Stranded”, which will come up a few episodes down the road, it’s all quality shows from here forward. One of the few bright spots in this episode for Rob was the first mention of fake movie titles in Prognosis Negative and Ponce De Leon. It’s one of the running gags in the show that Rob really enjoys. Rob mentioned that he can’t put “The Dog” at the bottom of the worst episode list because he enjoys saying Farfel so much. A Seinfeld-y thing in the news now that Akiva found was a clip from Jerry’s web show, Comedians in Cars Getting Coffee, where Michael Richards is impersonating the president of Crackle (the website that sponsors the show). In Jerry’s opening standup, he talks about how airplanes are able to make up time in the air after a delay, leading him to wonder why the plane doesn’t just go that fast all the time if it can. Rob and Akiva discussed if planes don’t always do this because of safety, ultimately concluding that it probably comes down to saving money by going at a more moderate speed. Akiva also added that Jerry deserves a pass for the hacky premise, noting that Jerry created many of these types of bits. 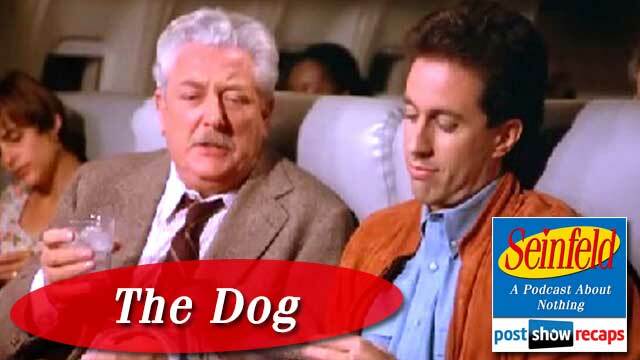 The episode begins with Jerry sitting in first class next to an obviously intoxicated Gavin Polone, who is telling Jerry about the virtues of owning a dog. Rob and Akiva agree that Gavin is one of the worst guest characters, perhaps a contender to take the crown from the woman in “The Baby Shower”. Gavin starts to feel queasy, causing an emergency landing in Chicago, but Gavin tells the flight attendants that someone needs to take care of Farfel, his dog, who is crated in the baggage storage. Jerry tries to avoid being the guy to take the dog, but Gavin doesn’t let him off the hook. Back at Jerry’s apartment, Farfel is in Jerry’s bedroom, barking incessantly. Akiva had put in his notes how fake Farfel’s bark was. He also pointed out that Tom Williams was the voice actor credited with Farfel’s bark, and he has credits as a voice actor in over 75 shows and movies. Jerry is at his wit’s end with Farfel, who is messing all over his house, tearing up his furniture. Rob thought that never seeing both Farfel and Kramer’s girlfriend in this episode was too much, and that it could have been better to show one of them. Jerry tells Elaine that it’s been three days since Gavin went to the hospital, and if he doesn’t hear from him soon, then he’ll take Farfel to the pound. Kramer comes in to share that he can’t watch Farfel for him that night since he has to break up with his girlfriend Ellen. Elaine and Jerry tell him they never liked her. Elaine refers to her personality as unpleasant as the Elephant Man is to see, while Jerry wonders why someone hasn’t killed her yet. Kramer is looking forward to hurt her feelings when breaking up with her. Rob and Akiva discussed the etiquette when a friend announces they are breaking up with someone they didn’t like. Rob said he’s always abided by the “first breakup doesn’t take” philosophy, and always offers a politically correct response. George shows up, excited for the three of them to see Prognosis Negative, only to be told Jerry can’t go. George and Elaine are both feeling awkward about going to the movie without Jerry, citing that they are “friends-in-law”, only tied together through Jerry. Akiva and Rob did note that George and Elaine were together alone when slipping George’s boss the mickey, but don’t really interact on their own. There is a mid episode standup bit where Jerry talks about how aliens would assume that dogs were the rulers, since humans follow them around cleaning up their mess, carrying it in little bags. The next scene is George and Elaine at the coffee shop after the movie, but Rob and Akiva wondered what movie the saw, or if they even went to see a movie. While drinking tea at the diner, it’s obvious how difficult a time they are having striking up conversation. They find a common ground making fun of Jerry about how he drinks Morning Thunder tea, not knowing that it has caffeine in it. Rob and Akiva found a series hole in George and Elaine’s talk about Jerry throwing up. In the black and white cookie episode, Jerry mentioned he hadn’t thrown up since 1980, and Elaine has only been in New York for six years. In between the scene at Monks, there is a scene with Kramer breaking up with Ellen in a mean way, shot as a point of Ellen’s view. There is another scene soon after with Kramer taking it all back, telling her he loves her. In the next scene, Jerry learns that Gavin had been checked out of the hospital in Chicago a few days ago, so he has no way of contacting him to pick up Farfel. He tells Elaine that he is just going to take Farfel to the pound so they can go and enjoy the movie. Elaine tells him he can’t do that, since the pound will kill Farfel, and offers to watch the dog while George and Jerry go to the movies. Kramer comes in upset because now that he is back together with Ellen, he can’t believe the mean things Jerry and Elaine said about her. George shows up and learns that Elaine is now not going to go, and he and Jerry can’t decide whether to see Prognosis Negative without her. Before they leave, Jerry wants to use the bathroom, which George and Elaine try to prevent so they don’t have to keep up an awkward conversation, even for a “normal human” amount of time. In line at the movies, Jerry and George continue to debate whether to just see the movie or wait for Elaine. Ultimately, they decide to see it, since Ponce De Leon is sold out anyway. The scene cuts back to Elaine, who is fighting with Farfel over a jacket. Gavin finally calls for the dog, which Elaine tells him he better come pick him up right now. In the next scene, Jerry and Gavin are talking in the doorway to Jerry’s apartment. He tells Jerry that he has Bell’s Palsy, and went directly to a clinic nearby after being released from the hospital. Rob argued that Gavin having Bell’s Palsy was an unfunny take on the situation. He found it hard to figure out if Gavin didn’t pick up Farfel right away because he was sick, or just on a bender. Before leaving, Gavin predicts that Jerry will be calling him to visit Farfel within the month, to which Jerry predicts that he’ll never see Farfel or Gavin again, then slams the door in Gavin’s face. Jerry and Elaine are talking about going to see Prognosis Negative, but Jerry, having already seen it and hated it, tries to convince her to see something else without admitting to having seen it. Rob and Akiva agreed that sitting through a bad movie twice is a hard thing to do. Kramer comes in and shares that he broke up with Ellen again, but this time, Jerry and Elaine give the politically correct answer. The episode ends with a classic bit of Jerry’s standup about a pet parakeet of his that used to fly into a mirror. In pondering whether this episode would hold up in 2014, they both agree that the whole episode wouldn’t be feasible, since Jerry could have just texted Gavin to pick up the dog. There were a few emails in the bag for the guys to answer. Johnny asked how Rob and Akiva would break up with someone, and if it would be as harsh as Kramer in the first breakup. Both agreed they would handle it much better. Johnny also shared that there are many shelters that would not kill the dog if brought to them. Emailer Chester wonders why Jerry would tell Elaine to put the syrup in the glass first, since it would get stuck to the side of the glass and be harder to stir. He also pointed out that the outfits worn are ridiculous. Chester wondered why George and Elaine would sit through an awkward conversation after a movie when they could have just went home instead. Rob and Akiva agreed on all three points Chester made. He asked a question directly for Akiva, wondering if George and Elaine had any other times together alone, which Akiva had shared earlier in the episode that they had conspired to slip the mickey. Rob added that this was a real plot hole. Lastly Chester wonders why Ponce De Leon would be sold out over Prognosis Negative. He pointed out that Prognosis Negative had tickets for all six shows, but Jerry and George were there at night, and when ordering the tickets, Jerry never paid for them. Gerinho pointed out that on the second watch of this episode, there was more to like about it, particularly Kramer’s breakup, then asked the guys if they ever had to tell a friend they hated their significant other. Akiva mentioned that usually the significant other of a friend usually hates him. Rob found that the significant other usually likes him, since he isn’t bringing out their mate to get crazy. Lastly, emailer Travis shares how he detests dogs, and also wonders if maybe Elaine saw Jerry throw up on video, since he hadn’t since 1980, which Rob and Akiva thought was a good point. Next week’s episode to recap could possibly crack some top 25 lists, when the guys will break down “The Library”. Akiva shared that he is working on his rankings of all episodes, that he hopes to complete by next week. 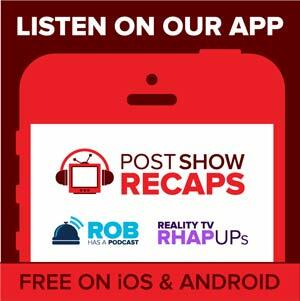 Don’t forget to subscribe to the podcast by going to postshowrecaps.com/SeinfeldITunes. Rob wanted to thank the listeners for their recent ratings and reviews on ITunes. It helped remove the lone poor review from the top of the page. You can also email questions to [email protected] by Wednesday mornings. And you can follow them both on twitter @robcesternino and @keev26.